This colour combination makes me think of the 80s. Loved the 80s! Great music, big hair, bright colours! Those teeny cupcakes are darling! 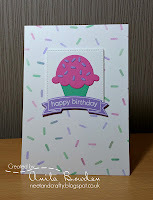 Bright, brilliant pink, polkie dots and yummy cupcakes....what's not to love??? Fabulous 'take' on the inspirational card Ardyth. I may not be around your blog much in the future as DH has cancer :-( but I do follow you on IG. This is fun! Did you make that background, too? These teeny cupcakes are adorable!! Sweet card Ardyth! Oh so cute Ardyth. Love how you were inspired by the Muse card. Oh this is darling with those sweet lil cupcakes lined up. Fabulous take. Just love those cute little cupcakes, Ardyth. Such a sweet card. Such a sweet lineup of cupcakes. Wonderful CAS card, Ardyth. 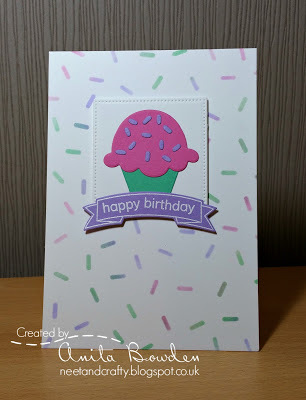 Adorable and sweet birthday card. What an adorable and stylish design!